The year 2010 and first five months of 2011 represented a bounce back from the lows following the Global Financial Crisis with foreign buyers honing in again on the island according to Colliers International Thailand’s Phuket Residential Market Report. The report makes a distinction between the inland area of Phuket which contains the vast majority of units and the coastal area with a lower number of properties and land plots but higher capital values. According to Patima Jeerapaet, Managing Director of Colliers, the coastal market is far more reliant on foreigners than the resorts of Pattaya and Hua Hin. 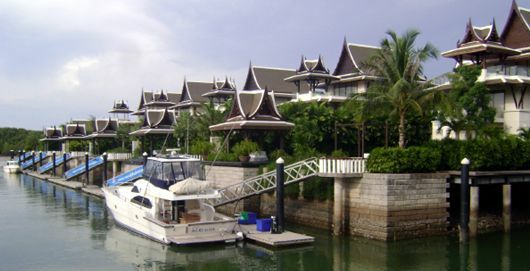 “Most wealthy Thais prefer having second homes in the resorts close to Bangkok due to the easier access and therefore the coastal areas of the island tend to be more foreign focused and therefore prone to the global economic situation”, he said. Although landed property dominates the residential market, especially inland, 2010 was one of the rare years when more condominium units were supplied. Around 1,020 units were supplied for 2010 while up to 200 units were supplied up to May in 2011. Most of the units are located inland and at present the Thai domestic market is acting as the main dynamo. The high end coastal market has yet to return to the heady days prior to the Global Financial Crisis but the success of a number of projects points the way to a recovery. “In many ways the glass at present can be perceived as half full or half empty depending on whether you are comparing with the period around 2006-7 or the situation in 2009”, said Antony Picon, Associate Director of Research at Colliers. Mr Picon pointed to the recent success of Andara in Kamala as an example that Phuket still remains the top destination for luxury property. “High end buyers are coming from a wider range of countries, not just Europe, with Hong Kong, Russia and the Middle East becoming key markets now”, he pointed out. Developers are reconsidering their marketing strategies to suit the changes in buyer profile. “One development called Kamala Falls is being marketed as a halal investment, including a women-only swimming pool, in order to appeal to Muslim buyers”, he added. In fact Kamala and the surrounding area on the North West coast is the up-and-coming location for high end development. Millionaire’s Mile contains plenty of land available for future development of luxury properties. An interesting prospect will be Phuket’s future as a marina for superyachts. Asia is fast becoming a cruising destination to rival The Caribbean and Mediterranean with less crowded waters in which to sail. “Wealthy Asians are now a strong buying force for superyachts and Phuket’s status as a renowned yachting destination through its marinas and exotic outlying islands could be enhanced through further development and boost the high end property market still further”, said Mr Patima. In fact the whole area encompassing Phuket, Phang Nga and Krabi could evolve as the world’s premier yachting destination in the future with Phuket as the main hub. “The Phuket brand stands for luxury”, added Mr Patima. One other important factor in Phuket’s favour is the growing number of international direct flights especially as result of the proliferation of Low Cost Carriers. Mr Picon believes this leads to greater numbers of tourists coming to Phuket which will eventually translate into property buyers. “The residential market in Phuket for foreigners has yet to return to the pre-Lehman days but it is well positioned when buyers from the traditional markets in Europe and the United States return to compliment to growth of the emerging markets”, he added.